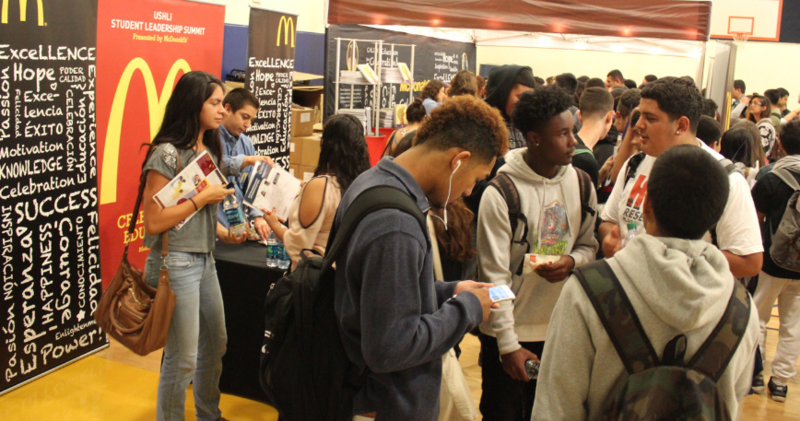 USHLI is partnering with StriveScan to offer student scanning at all of this year’s college fairs. StriveScan is used at fairs around the country, including those sponsored by Pacific Northwest ACAC, Western ACAC, Hawaii ACAC, Great Plains ACAC, Missouri ACAC, Illinois ACAC, New England ACAC, New Jersey ACAC, and internationally by the Council of International Schools and Linden Tours. We will have students registered with barcodes that you will be able to scan through the StriveScan mobile app on your phone. At the end of the fair, you will be able to export your scans instantly. Students also receive an email the next day from StriveScan with a list of colleges they scanned with along with your contact info. To scan at any of the fairs, you will need to create a StriveScan account and download the app to your iPhone, Android, or iPad. You simply purchase Fair Credits via StriveScan’s website to unlock scanning at any of the fairs. One Fair Credit unlocks scanning at one fair and costs $24. You will receive a separate email from StriveScan with full instructions. Is this event free for recruiters? Yes, the event is free for recruiters. The StriveScan feature is optional tool. How many recruiters can attend from my institution? We recommend that a maximum of 4 recruiters per institution attend each event. How many students will attend each college fair? Are they from different schools? Approximately 1,000 students will attend each event. Students will be from the same high school and they will represent all grade levels. Where will each college fair take place? Each college fair will take place in the school gymnasium. Please check-in at the main office. Can students from other schools participate in these events? No, only students from each designated school can participate in these events. The registration links are only for post-secondary institutions looking to recruit incoming freshmen. What if I have questions the day of the event? Please text Laura Bedolla at 262-298-9725. Next Next post: USHLI Conference Registration is Now Open!